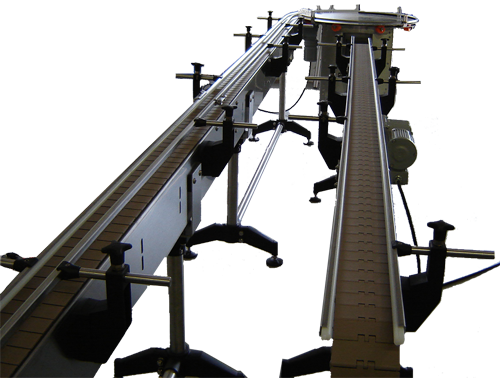 Cheetah Systems Table Top Chain Conveyors are built directly to the customers specifications. Straight, curved, inclines, or declines are all manufactured here at our facility in St. Petersburg, Florida. Cheetah Systems specializes in fabricating stainless steel conveyors for food processing and bottling applications. Conveyor frames are constructed of 304 stainless steel and are available in many different finishes. All types of guide rail configurations are also available.